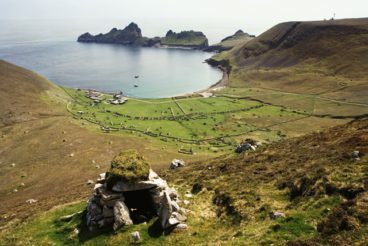 Archaeologists Angela Gannon and George Geddes spent over 9 months living and working on St Kilda as part of a team researching the island’s unique history for more than a decade. Turning the popular perception of the archipelago on its head, here the authors explain how tourism, from 1758 through to today, has shaped the island’s changing social and physical landscape. Two noted heroes were drawn out from among the ablest men of the community: One of them fixed himself on a craggy shelf: His companion went down sixty fathoms [110m] below him; and after having darted himself away from the face of a most alarming precipice, hanging over the ocean, he began to play his gambols: he sung merrily, and laughed very heartily. The crew were inexpressibly happy, but for my part, I was all the while in such distress of mind, that I could not for my life run over half the scene with my eyes. 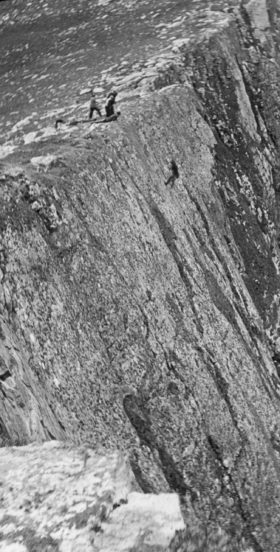 A man standing on a cliff edge on Hirta, St Kilda. This is the earliest description of a St Kildan deliberately trying to impress a visitor with a display of their climbing skills: it was a performance that would be witnessed by many over the next 180 years. Macaulay and his fellow adventurers portrayed a visit to the islands as an experience of high drama and romance. In the aftermath of the Jacobite Rebellion, the political temperature of the Highlands and Islands cooled, opening up the opportunity for what Elizabeth Bray has called the ‘Discovery of the Hebrides’. Visits to St Kilda for the most intrepid became more common from about 1800, but notable early travellers, including Thomas Pennant and Samuel Johnson, never reached St Kilda, and we often need to turn instead to accounts produced by lesser known writers. 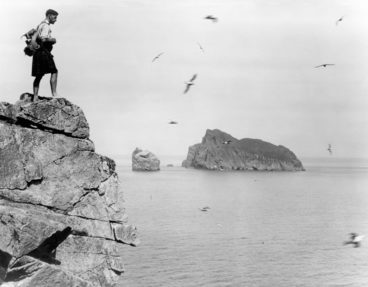 Men fowling on the cliffs between Connachair and Oiseval on Hirta, St Kilda. In 1831, George Atkinson set a precedent when he chartered a boat specifically for the trip. Just three years later, the Glenalbyn became the first steamship to reach Village Bay, causing ‘excitement and astonishment’ among the islanders. The reaction of Sir Thomas Dyke Acland that same summer is recorded in his journals and letters, which betray both a recognition of the St Kildans’ abilities – one islander was noted as ‘rather intelligent’ – and a pressing need to judge them. Tourism, even at this early date, was mixed up with morality and philanthropy. The sharp-witted St Kildans seized the opportunity to capitalise upon the chance to sell souvenirs. At the same time, Acland provided the St Kildans with 20 sovereigns ‘to help them build new houses’. The impact and intervention of tourists could be both dramatic and well-intentioned, in this case providing the catalyst that brought about the wholesale redevelopment of Hirta’s housing and farmland in Village Bay. The first visit by a scheduled commercial vessel came in 1877. The steamer Dunara Castle arrived from Glasgow, carrying about 40 passengers on a tour of the west coast. At this time the St Kildans themselves, as well as the romantic landscape, were the subject of a pervasive and perverse interest. Their community was cast as an example of an evolutionary backwater – a survival of ‘the past in the present’. For their part, the islanders looked forward to more prosaic advantages, such as ‘regular post and communication’. 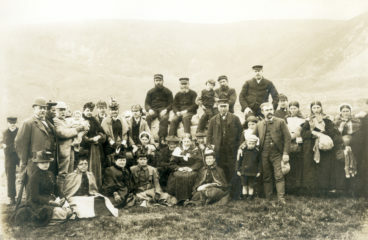 A group of St Kildans with visitors and a ship’s crew pictured in the Village on Hirta, St Kilda. The Dunara Castle and other steamers continued to ply the route to St Kilda until the outbreak of the Great War. As in the years before the war, after 1919 the steamers not only brought an influx of visitors, but also the opportunity to import foodstuffs, as well as export the islanders’ own produce. 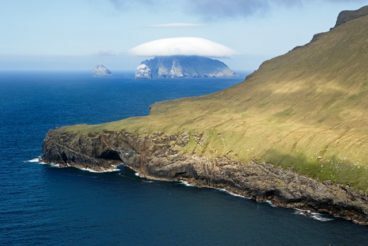 After the evacuation of 1930, the steamers continued to visit during the summer, although now their only purpose was to bring the tourists, including some St Kildans, to the islands. 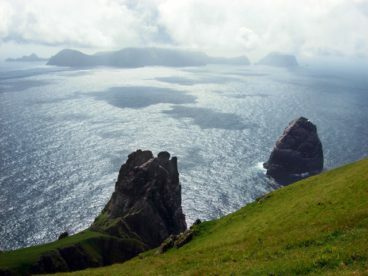 A major hiatus occurred after 1939 when, for the first time in over 60 years, there were no regular trips to St Kilda. The era of modern tourism began about 20 years later, with the first visits of the NTS cruise ship SS Meteor. Short trips, although not a new invention, are now far more commonplace, with as many as five boats coming to the island on any one day. Some 5,000 visitors can now reach the islands each summer. The effect of tourism on the archaeology of the island is important in two respects. Before the re-occupation in 1957, the practice of archaeology on the island was sporadic and piecemeal, being often undertaken by tourists and ‘sightseers’. The second effect of tourism has been on the landscape. While crofts were established over much of north-west Scotland by estates and their factors, the catalyst on St Kilda came from Acland, a tourist. Furthermore, the advent of work parties on St Kilda from 1958 has itself created a continuing link between tourism and the active management of St Kilda’s landscape – the sites within Village Bay now being kept in a state of arrested decay. Looking back to the beginnings of tourism, the old steamships that once provided such a crucial link for the islands also offered trading opportunities and connections. The very existence of the community became enmeshed with seasonal visitors and, even now, their demands continue to have a great impact on both the modern and historical fabric of the islands. On today’s St Kilda, it is seldom clear where tourism begins and ends, and which of us is a visitor. St Kilda: The Last and Outmost Isle, by Angela Gannon and George Geddes, is published by Historic Environment Scotland on 15 September (PB, £16.99). All images in this article are taken from the book.